On a long travel day, a shower is an elusive but critical accomplishment. And unless you have lounge access or you’re booking an airport hotel, you’ll be hard-pressed to find one at the airport. For freshness you can take with you for any situation, a pack of extra-large Goodwipes can really save the day. Price and Where to Buy: A pack of ten Goodwipes is $10 on Amazon. Usefulness: 8/10. These wipes are extra-large, so one will be enough to freshen up your whole body. I also appreciate that they’re alcohol-free, leaving skin feeling neutral and not dried-out or sticky. Value: 9/10. At a dollar per wipe, a pack of these is a steal. One wipe was enough for my whole body twice-over, so you probably won’t need to use as many as you think. Durability: 10/10. 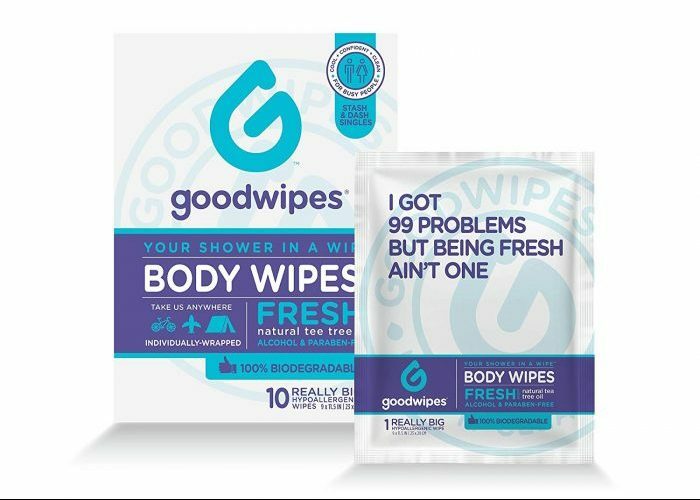 Goodwipes are light but sturdy, so there’s no need to worry about tearing or disintegration as you use them. Portability: 10/10. The single-packet design of these wipes makes them easy to keep in just about any bag you have, so you can keep one handy throughout your trip to use at any time. Cool Factor: 10/10. They smell good, work well, and they’re biodegradable. Final Verdict: A wipe-down, even one infused with tea-tree oil and peppermint, is no replacement for the resetting-power of a hot shower. But Goodwipes come as close as you can get.